One interesting bit of Hamilton trivia is related to the 1936 Clark and the 1940 Yorktowne. These models are often mis-identified as each other as they were not made at the same time but are almost identical. The Clark was made for three years, 1936 through 1938. The Yorktowne was introduced in 1940 and was made for two years until impacted by the start of WWII. The main difference between the two is the Clark has a 14K gold filled case, while the Yorktowne has a 10K gold filled case. Also, they used different styled hands but sometimes the hands are changed so the cases are the best judge. Other than that, you'd be hard pressed to tell them apart. The Clark also came with an inlaid black enamel dial - while the Yorktowne came with an AGN dial only. You rarely see the Clark with an enamel dial though. Both models share the 14/0 17 Jewel 980 movement. Both are also prone to wear through on the front of the lugs, back of the lug tips and along the sides of the reverse. The Yorktowne probably holds up better though - as 10K is harder than 14K. And here's a beautiful shot of an enamel dialed Clark, courtesy of Tom Diss. Hi there! I have a 17 jewel 980 movement hamilton watch. Serial is g553823. Looks like the yorktowne but Yorktown looks a bit more elongated. What does a typical restoration cost? Do you do this type of work? If so, can you send me your contact info? That serial number dates to about 1948 so it's a bit late for a Yorktown. My contact info is in the up right - where it says contact me by clicking here. I'm just a hobbyist and generally don't work on other people's watches - as that's pretty stressful and I don't like the idea of goofing up someone else's watch. But if you email me a picture or two, I'll tell you what you have and give you a couple recommendations on where to send it. given illustration above my affection for the enamel dial watch is growing. hey dan... I recently had a clark restored, but the hands are wrong. Do you have an idea on where I could find a pair of original hands or what the style of hands are called? Thanks! The Clark uses "Spear" hands and the Yorktowne uses "Lozenge" hands. I may have an extra set. Send me an email and I will look and see. If it is 10K gold filled and looks like this it's a Yorktowne. If it's 14K gold filled, it's a Clark. Regardless, a 14mm Long or Extra Long strap will fit a man's wrist. Non-tapered is the better choice. 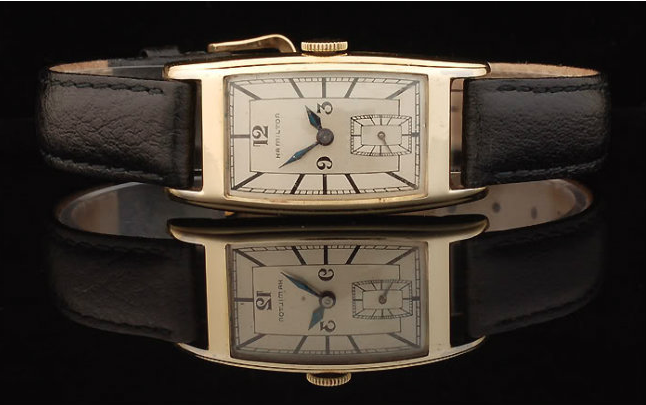 That's a 1938-ish movement but there are a bunch of gold filled models it could have gone with. If it has a dial that would be a definitive clue. Well, Mr. Dandy, U must B quite the busy gentleman. 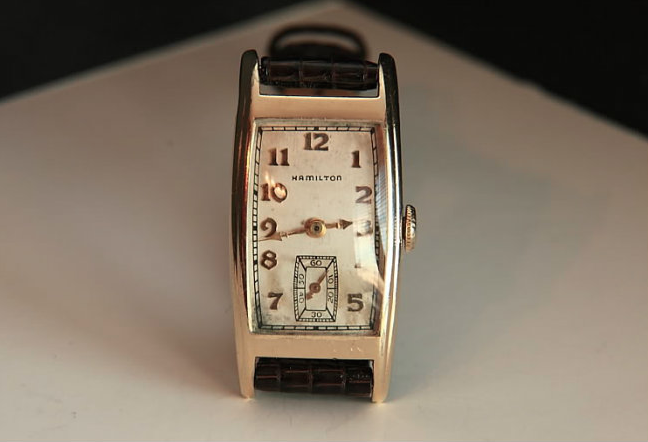 Through diligent (internet) research, I've discovered that the Hamilton Men's wristwatch I possess is actually the 1941 Myron-Coral Gold-10K G.F. rectangular case along W/ the original 10K-G.F. Bracelet of "Kriesler Quality, Top 1/20-12KT G.F, Bottom Duro-Brite." 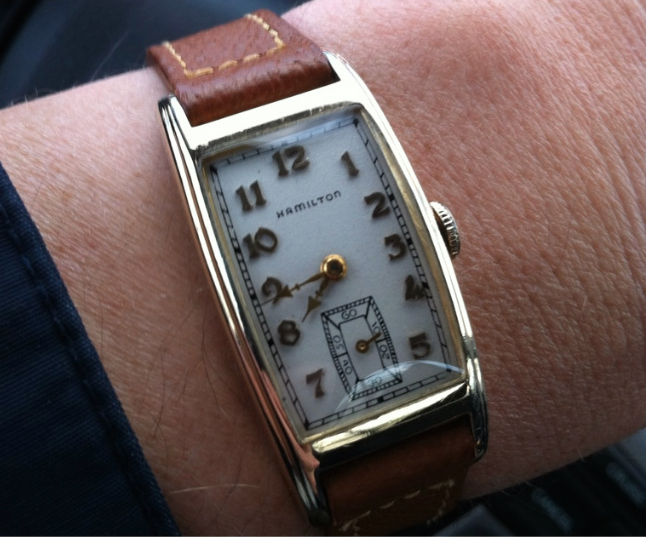 It's certainly in acceptable condition for a 76 Yr old, G.F wristwatch. The plastic "Crystal" was scratched rather deeply in some areas, but that was nothing that good 'ol toothpaste wouldn't buff away after a few takes. I'd love 2 forward (publish pic's of the watch in it's before & after conditions, but am uncertain as 2 how to accomplish same in this forum. 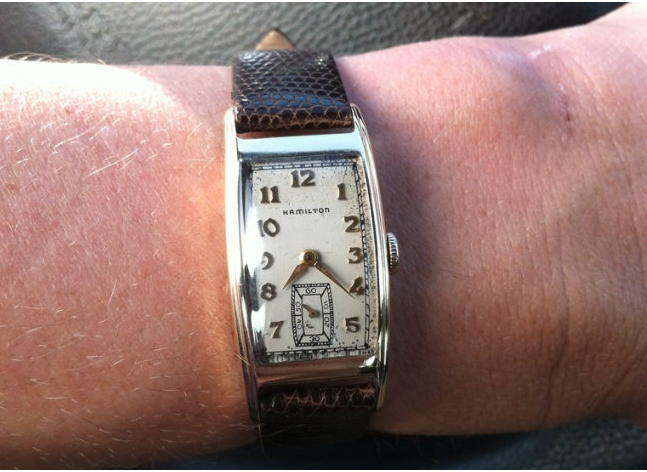 Join www.vintagewatchforums.com and you can post photos for discussion there. Hi Rick, the case serial number doesn’t mean much. 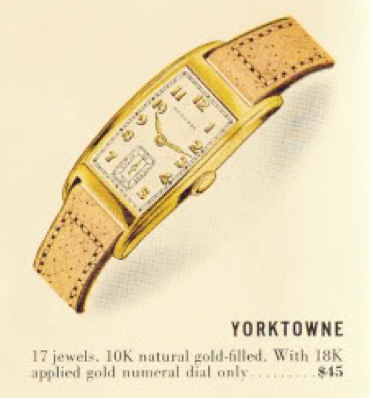 If the case is 10K gold filled then it’s a Yorktowne. The 980 is capable of excellent time keeping and can do better than 2 minutes per day accuracy. Sounds like you should have it overhauled by a watchmaker. Thanks for getting back so quickly. I was hoping you would say, "Oh, that sounds like a project I would love to take on for you!" Then I would reply, "In that case I'll also ship you my slow ca. 1927 grade 992 that runs slow." I try to keep my blog unbiased and non-commercialized. It's focused on vintage Hamiltons but I'll even talk about Elgin's occasionally - so all are welcome. Haha! If you email me or contact me through my Etsy shop I can direct you more specifically. I don't know anyone in St. Louis but you can look at the AWCI.com website to see if anyone registered is in your area. I own a 1941 Myron in pretty decent condition. It came with, what I believe 2 B, the original (optional) "1/20 12k G.F. Kreisler Quality" bracelet. I must have hit the wrong "Reply" prompt and sent a message to you that I meant for Dan. It was nice to chat with you, as inadvertent as it may have been!